Central to the discussion of Corte Madera’s housing concerns is that it is built-out. There is no more developable land, and its commercial areas are productive and full. Where will more people go? The answer lies in Corte Madera Town Center’s parking lot. Corte Madera Town Center, block 024-163. Click to enlarge. Over the next 28 years, Corte Madera is projected to grow by 204 units, most of which will be enforced by the state through its RHNA process. The town wants to rid itself of RHNA by quitting ABAG, saying that the assignment of so many units is simply too high given the fact that there is no unused land to develop. Enter Block 024-163, occupied by the four story Town Center mall, two gas stations, and a buffer along the Tamalpais Drive exit ramp. Of the 31.7 acres, only 7.5 acres are used by buildings, leaving the other 24.2 used by parking or parking access. Town Center prides itself on imitating a vaguely Mediterranean village, with narrow brick walkways and arches. Transit access is provided by no fewer than eight all-day bus routes and two commute routes. By bus, it’s 45 minutes to San Francisco, eight minutes to San Rafael from the bus pad, and it’s walking distance to downtown Corte Madera, the Village, and most of Central and Southern Marin are biking distance. 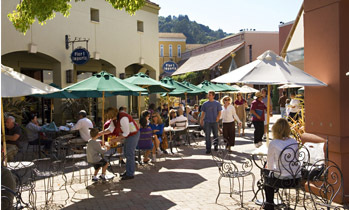 Town Center has a grocery store, doctors, cafés, and restaurants. I can’t think of a better spot to put some low-rise apartments. My concept is for Town Center to fill its entire lot rather than just a fifth of it, creating a walkable village that activates the streets around it for foot traffic and develops a bustling hive of activity on the inside. Even with parking garages using a quarter of the lot, the design could accommodate between 400 and 665 units of housing – far, far beyond what ABAG projects the town will need to build. People actually live in places like this. From MadisonMarquette. From the inside, the Town Center would look much like it does today: winding pedestrian streets 20-30 feet wide dominated by retail. The closest American equivalent I can think of is Santa Barbara’s Paseo Nuevo. Located downtown, the two-block mall opens directly onto the sidewalks, integrating seamlessly with the rest of the city. Small retail bays would encourage locally-grown shops that couldn’t afford larger retail, and encouraging studio apartments would ensure little undue pressure on schools. The catch is that this sort of project is illegal under Corte Madera’s current zoning codes. Even the Mixed Use Gateway District is too restrictive, as it was tailor-made for the Wincup site and requires a parking space for every unit. The parking requirement would be particularly foolish for a development that relies on walkable, transit-oriented living, as it would impose onerous costs on the development for minimal return. For the site to develop properly, a new zone would need to be developed for the site. Perhaps (and I’m spitballing here) a minimum of 40 housing units per acre but no maximum; no parking minimum; no restriction on what sort of store or office you could open on the site, contrary to what the code currently allows; a maximum height of 30 feet for the street, 45 for the interior; and a rooftop garden, to filter out the nastiness from the freeway. If the developer were allowed to unbundle the parking from the residences, meaning a resident could choose whether to just rent an apartment or to also rent a parking space, it would take some pressure off the need for more parking and allow the developer to figure out for itself how many spaces to build rather than rely on diktat from town hall. 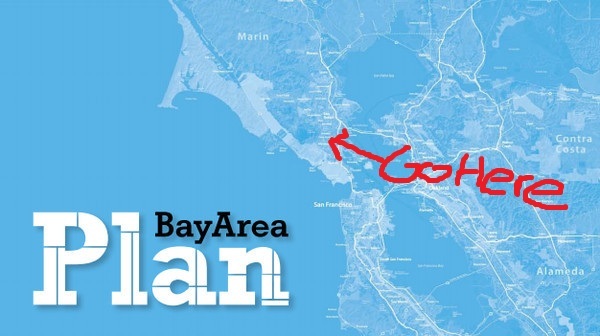 The density may be enough to encourage Zipcar, the car-sharing service, to finally open in Marin. Studies have shown that one Zipcar takes 15 cars off the road, and that users tend to make fewer trips by car. If town hall wants to encourage transit use, too, it could facilitate a six month free bus pass program for anyone who moves to Town Center. Studies show that transit use is sticky – few people switch from transit to driving once going from the driver’s seat to the passenger seat – so putting people that already live in a walkable place onto transit from Day One will mean less traffic for everyone. I present this project as a talking point, a concept of how Corte Madera could build value for itself through the affordable housing allocation process. The childless singles and couples that would move there would add tax revenue to the town without any additional burden on the school system. Rather than just a mall, Corte Madera would have a new village in Marin, and all on land that the city now thinks of as “built out” and undevelopable. These aren’t high rises, nor are they Soviet apartment blocks. By opening the door through zoning, rather than just constructing affordable housing, developers would be free to build housing however the market supports. Every parking lot is an opportunity for something new. Storing cars isn’t a high use for land. It’s untaxable, and it leaves the land fallow for most of the time. 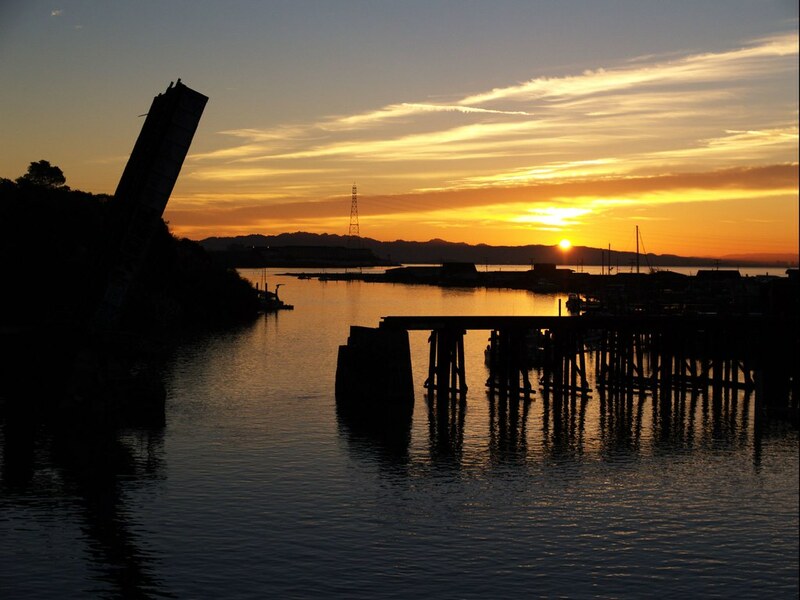 Corte Madera has the space for new housing and, more than most towns, it has the location. No matter what the town does it will need to build more housing. This is the best place for it.